Health professionals carry huge amounts of medical information in their heads. The profession demands it. But as life progresses and there are other responsibilities (as a parent, HoD, office bearer of an association or administrator) that creep into one’s life, there are lots more activities that need doing. These tend to be overwhelming, especially as the world today, has become too focused on speed in every activity. Evernote is an app for your smartphone, tab and your laptop/desktop. As the name suggests, it is an application that acts as a platform for you to take notes, and in the process, basically becomes the pocket notebook of the digital age. It syncs easily and automatically across all your devices and across all operating systems. You don’t run the risk of losing scraps of information, since this is not a form of a post-it note or a piece of paper that you may easily misplace. Via Evernote, you will also be able to remove the pile of paper reminders you would have to go through on your desk and move into a single digital storehouse of information. You can share notes and notebooks with your classmates, colleagues, staff, family and whoever else you choose, via your Evernote app. You can take and attach pictures to a note within the app itself. You can also attach voice memos and audio. 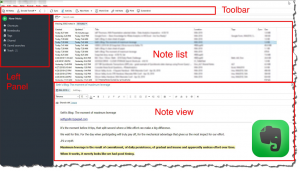 A number of files; such as spreadsheets, images and documents can be attached to your notes. You will be able to set self-reminders for various tasks, goals and projects. You will be able to automatically sync between all your devices, which effectively allows you to access your notes even in offline mode. An icing on the cake- Evernote is free. There is premium version, which allows more. The basic version, however, includes ALL of the features we talked about above. On a personal note, many of us at QMed use Evernote as a means for communicating with each other and as a digital notepad for setting our day to day tasks straight. It has also been instrumental for our brainstorming sessions. We encourage all of you to try it out for yourselves here!